It has been an unimaginable experience watching your child decline. Gavin now shows signs of brain death, but they need to do an official exam in two stages that will end up taking all day. Once they declare him "brain dead," we will prepare to say our final goodbye. Brian will be here soon with the amazing Miss Sara who we couldn't have gotten through these days without. The "Child Life" team has a lot of activities lined up for Gavin and Brian to do together - including side by side brother hand prints. They will help us explain to him that Gavin will soon die and will be in "Heaven's House" as he calls it. Brian often talks about Heaven and has a happy, happy view of what it's like there. I hope today's experience will help us bring closure to Brian... and help heal our hearts as well. So so many prayers for you and your family as you say good bye to your sweet son. Amazed by your amazing grace and brought to tears by your strength. I am sobbing as I read this. You and Gavin both are such an inspiration. I am so sorry for the goodbye- for this turn in the road- for this world no longer being blessed by sweet Gavin in a physical sense. Praying for you. I wish I knew you in person so that I could be there for you right now. I am here for you in spirit. And I send so many virtual hugs your way. I am so very sorry. I pray you and your family can find the strength to get through this. My heart is very heavy right now. I don't know you but I am thinking about you and praying for you. I cannot even imagine going through this. Your grace astonishes me and the lump in my throat will not go away. Praying for Gavin and your family. Thank you for sharing your son, your family, your stories with us. May Gavin continue to bless everyone. You have written in the past that you knew Gavin was brought to this world to do great things. It's clear that he has, and that his gifts will continue even after his physical presence departs from this world. I pray for all of you who love him, that you may find strength and solace in one another. Godspeed, Gavin. We are thrilled for Gavin and heartbroken for your family at the same time. And we continue to pray. I'm so very sorry. My heart is breaking for you and your family and want you to know that I have been touched by your story and delighted by your son. I'm very sorry to read this news and I will hold all of you in my heart. I commend you and thank you for allowing Gavin to continue saving others through organ donation. As a mother currently waiting to hear if my child will even be considered for a heart and lung transplant, it is courageous parents like you, giving of yourself in darkness, that give me the most hope for tomorrow. Thank you. Holding you all so very, very close. I am so very sorry, Kate. My heart is breaking for your family. Kate this is agonizing to read, I am flooded by sadness and tears. I am sooooo sorry I know how hard this must be for you, I've followed your journey from the beginning and have always been inspired by your dedication and willingness to do anything and everything for Gavin, I am sending you so much love and light and I am so very deeply sorry for what you are going through. There are not words to express my awe and admiration for you and your husband at this most tragic time in your lives. As a cardiac ICU nurse at Cincinnati Children's Hospital I am often inspired and amazed by my patients and their families. May God Bless your family with peace and memories of your precious Gavin and hold you close as your mourn his loss. I also want to say thank you for your absolutely beautiful gift of sharing life with the gift of organ donation. I will keep you and your family in my thoughts and prayers, I am so sorry for the loss and pain you are going through. Hugs and love for your family. I am so sorry for your loss and grateful for Gavin's peace and freedom as his journey continues. Your collective grace, strength and wisdom are inspiring. I hope the love extended to you by so many, brings you great comfort. You are all in our Prayers. What a blessing he will be giving so many others by donating his organs. So many prayers for you and your family. What a beautiful gift Gavin has been to you and to us all. Dear Gavin, Have fun in Heavens house. Run Play and enjoy your new home. Mommy and Daddy are very strong and will take good care of your brother for you. I know it will be hard for your mom and dad and brother. they will miss you very much but because they love you they will be happy because you will enjoy peace and love and not have to fight so hard. Kate, I saw your story on Momastry and began praying when I read it. As a mom of two young toddlers I can not fathom what you are going through, but please know I am praying for you to feel the love and peace only Christ could give you in such a time. I pray that he wraps you in his loving embrace and holds you while you say goodbye and gives you so much reassurance that he will take care of Gavin. Gavin was on loan to this earth and you for only a short time and now He must need him home...big things for him to do in Heaven. Praying with a broken heart today. I am very sorry for this change. I will be thinking of you and your family and hoping you continue on the path of inner strength that your son helped you find. Crying as I write this and amazed at your strength and grace. Love and prayers to your family....especially sweet Bryan. I am sobbing for you. I am so sorry for you and your family, but I am so very happy for Gavin as he will be healed. I wish it didn't hurt so badly for those of us who are left here on this earth, but I'm rejoicing as I think about the Homecoming that is to come - for Gavin, and for you as you will be reunited with him and Darcy! 'Being' with you in spirit, in silence. I'm so sorry Kate.... I'm so glad you're donating his organs, so he can live on. I have been following your posts daily for the past couple of years but have never commented. Today I am heartbroken and felt the need to let you know I am sending my thoughts and prayers your way. I was so hoping for that miracle. All of my love and prayers are with your family today. Gavin's sweet spirit will live on through all of those whose lives he touched. I am sobbing as I read this. I have followed your blog for a while now and I feel like I know you and your family. You are an amazing mom and I have always looked up to you. As I have said before, Gavin reminds me so much of my Andrew and my heart aches right now. I will continue to pray for Gavin and you family. But I so know he will be so happy to see his brothers and sisters and to do so many things that he couldn't do in his human body. God bless! 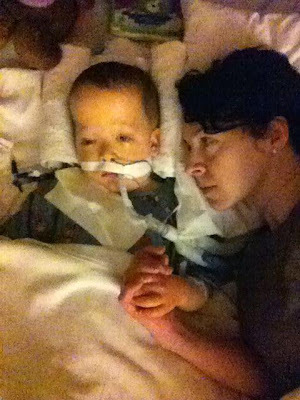 This just breaks my heart, but at the same time I rejoice for Gavin. He will now be free and happy in the arms of our Lord. I will continue to pray for you, Ed and Brian as you start your new journey in this life without Gavin's physical body. The adjustment will be hard at first but I'm sure with your strength, faith and so many praying for you, you will be OK until you are all reunited in heaven. My sincerest sympathies to all. Gavin is a very special person and God carefully selected two very special parents to shepherd him in this life and enable him to touch as many lives as possible. May you find comfort and joy knowing this is not goodbye, it's just a see you after awhile. Be with angels, Gavin. Be free. We love you. You are such an inspiration to us all. And Gavin..... sweet, sweet Gavin....He is my hero. He has touched us all- a true angel, here on earth. My thoughts and prayers have been with you all these past few days and I continue to hold you in my heart. I wish for you strength, courage, comfort, peace and grace today and the days that follow. Today is my dad's birthday. He would have been 64 today, but I am not able to celebrate with him as he is up in Heaven. I am sure he will save a great big piece of cake waiting for your sweet Gavin to celebrate with him. Keep chasing those rainbows Kate...... that's what Gavin would want. God Bless you all. xoxo, Stephanie J.
Oh my heart breaks for you all. I am at a loss for words except to say that Gavin will always be with you. My dad died in November and we too will be spreading some of his ashes in OC. My family has been going there for four generations and it too holds a special place in our heart. When I leave my dad there, I will ask him to look out for Gavin! I am so sorry that you, Ed, Brian, and your family and friends have to endure this. Wishing you the peace that passes understanding as you journey on. I am blown away that you were able to put up such a well written post -- I am glad that you find such solace in the on-line community and those of us strangers that have peeked into your life and found that we care. Blessings to you for using this difficult circumstance to bring hope to others who need it through organ donation. Much Love, Peace, and comfort to you and your family. Kate--You are truly inspiring. I never knew when I started following your blog, how attached to your family I would become. It breaks my heart to hear about Gavin, but I know now that not only will Gavin be "Chasing Rainbows," he will also be creating them. What a special little boy. I am praying for your family. God bless you all. Gavin will be loved and remembered by all those who have known him and read about him in your blog. You have my heartfelt sympathy. May the love and strength of your family help you through this grief. Left a message on facebook but can't stop thinking about you today. So much sadness, tinged with sweetness at the same time. Kate, your open spirit and willingness to share your family's story has touched so many and made such a difference in the world. Before even donating his organs, Gavin has changed lives. Sending positive vibes to you. And hoping Gavin's next adventure is filled with lots of running water, waves, more marathons, Little People videos, and all that he loves. I pray for peace for you and your family. Your story has touched my heart. I pray for peace and the reality of God's love, even in a time like this. My heart is breaking for you. Know that Gavin inspired so many of us and changed so many lives for the better. You, like so many of us who have lost children, live with one foot in this world and one foot in another. God Bless Gavin and your family. While I don't know you, I have friends who do and who posted a link to your blog on their Facebook pages. I have been following it the last couple of days. My thoughts and prayers are with you. Gavin sounds like an amazing little man and you (and the world) have been supremely blessed to have him even for a short period of time. I know that doesn't fix the heartbreak - but I hope it helps - even a little. Blessings to you, your husband, son and all those who have been touched by Gavin as you take this journey with him. So many prayers...for all of you. Amazing mothers raise amazing children. No words to ease your pain, but know you are held up by mothers around the world in prayer. We won't forget you or Gavin. I have followed your amazing story since the beginning on Caring Bridge. I looked forward to seeing new accomplishments by Gavin everyday. Such an amazing child! But I don't have to tell you that. My heart breaks for you and your family, and the sudden turn of events. But as always, you are the comforter, and your attitude is so inspiring. It is wonderful to think of Gavin running and giggling in the beauty of heaven. Peace be to you and your family, along with continued prayers to get through today, and the many days ahead. We are all saying goodbye to Gavin with you. I just stumbled upon your blog yesterday and have been praying for sweet Gavin. I know he will run and sing, laugh and play up in heaven. He is such a strong little guy! Prayers sent your way today. God bless your amazing family. There is a miracle... it is that through Jesus Christ we are victorious over death. In Heaven Gavin will be whole again, he will have a new body. One in which he can run and play. I cannot fathom your heartbreak... although my heart really is hurting so badly for you right now. It will only seem like a moment in time for Gavin before you are all together again, although I know for you, Ed and Brian it will feel like an eternity. I know Gavin will be with Jesus, and for that I am so happy, but for you I hate this. I really, really hate this. I am so sorry and I will be praying for you and your family and all of Gavin's loved ones. Kate, I've never been this so distraught for someone I've never met. I wish I could take your pain away from you. No mother should have to go through this. Gavin's life will not be in vain. Of course you know that. But even for the ones you've never met, we will not take our children for granted. We love Gavin, truly. I'm so sorry to hear this - of your sweet Gavin. What a tremendous loss for your family, and the world. I will hold you all in my prayers and heart. God Bless. I have been reading your story over the last several days, and already feel like I know you. Thank you for sharing your journey with us, and for continuing to share a message of hope and love, even as you say goodbye to your son. Thank you for sharing his life with us. I am awed and inspired by Gavin. Many, many prayers and love to you and your family and loved ones. I'm weeping in sorrow for you and in joy for Gavin. I'm sure he is playing with Jesus right now. I know your heartbreak will never end, and I'm so sorry you've had to experience so much loss. My words cannot adequately convey my feelings for what your family is about to endure...I only just came across this today but I will remember Gavin. I have only been following for a few days, but I prayed so hard for your family and for Gavin. There are no words to ease or take away your pain. I am sending positive thoughts and healing light your way as Gavin embarks on his new journey. The wonders of heaven will be glorious for him to explore, relish, and drink in. You will all meet again. There are no words. I am so so sorry for your loss. I will keep you and your family in my thoughts. I wish you love and light wherever you can find it in the days to come. I am just one among the hundreds of people who got to know Gavin in the last couple of days, and became invested in praying for him, sending positive energy, and wishing for a miracle. My heart is breaking for your family. No parent should have to go through making the decisions that you are making. As the mom of a little girl with a transplanted kidney, I thank you from the bottom of my heart for letting Gavin live on in other children. Wishing you love, light and peace. Praying for you all through my tears. Your sweet boy is a blessing to the world. Words cannot express how sorry I am for your loss. I am so heartbroken for you. My thoughts and prayers are with you and your family. I just recently happened upon your blog and have prayed for your family every day. Your post today has so much love in it. I will continue to pray for your family and I am grateful to have been able to see the love you have for him. Prayers for you and your family. Love and much prayers and hope for Gavin. A part of my heart is with Gavin and your family today. I'm sorry sounds so trite. But I am. I just started reading your post when Gavin go sick. I am not sure the reason that you came into my life but God wanted me to know your story. I am praying for you and your family and hope you find comfort that Gavin will be with him. Also? As a kidney transplant recipient, I cannot thank you enough for donating his organs. Please know you are giving beautiful gifts during this pain. I have been on both sides of that heartbreaking dance. Praying and sending love and light. I just came upon your blog two days ago after a prayer request from momastery for your family and your sweet boy Gavin. I am heartbroken for you and with you. May you find peace in this journey and healing in the days to come. Bless your family and sweet, sweet boy as he makes this journey home. Honored to have come to know your story, and so, so sorry for your heartache. Your grace and goodness are an inspiration. Lifting you up in my prayers. I am so sorry for your loss. Prayers of peace for your whole family. I am astounded by your love, faith and bravery. You will see Gavin again. Young, healthy and full of life. The sorrow of this parting gone forever. Kate, Gavin has affected many, many people's lives, including mine. He has done so much good in this world, and he will keep doing so. I am sending so much love your way. I am so very sorry. May you find peace, light and love in the coming days as your world is filled with a sadness that no mother should ever have to endure. Your Gavin...an amazing little boy who has and I am sure who will continue to change the world. You are in my prayers. I came here from Momastery a couple of days ago and have been praying for your family. What an amazing mom you are to continue to share Gavin's blessings and lessons. Will be saying many Hail Marys for you and your family. May the Lord give you PEACE and Strength. My heart is breaking for you.Margaret and family from CA. You are in my prayers. He was remarkable. Truly remarkable. Sending your entire family love, light, and energy. Your children (all of them) are so very lucky to have you as parents. Thank you for sharing your story with so many strangers. You and Ed are inspirational. Praying for you all. Praying for God to comfort you during this time. I am so very saddened to read this news. I was directed to your blog and lovely family via Momastery earlier this week and have been praying hard for Gavin to get better and for strength for you, Ed and Brian. My thoughts are with you during this unbelievably and unimaginably trying time. I will pray for your whole family. Words cannot express the sadness I'm feeling today. Gavin is an amazing boy and even though I've never met him I looked forward to reading about his triumphs each day. Kate, you are my standard when I think about what it takes to be a great mom. I hope your family finds peace during this heartbreaking time. I am so sorry! My prayers are with you! May his sweet memory be a blessing to you always. What am amazing child! Not the miracle hoped so hard for, but there is a miracle today. Your story of love, strength, family, and faith spreads inspiration to everyone that it touches. We come together as a community of (mostly) strangers bound together via Gavin and his family in hopes of holding you up in prayer. We all hold our loved ones tighter today. That is the miracle of today. I hope you can take some small comfort in that. It's time now for your baby to get up and play and run and dance and sing like he was never able to do before. I'm heartbroken for you and your family but happy that Gavin is no longer suffering. Peace and love. You are truly a remarkable person and mom. My thoughts and prayers are with you and your family. Gavin has brought hope to so many people around this world. He has touched the hearts of more people than you'll ever know. He is a beautiful soul and has had a blessed life full of nothing but happiness and love. You will all continue to be in my thoughts and prayers through this journey. Sending a little more love to Gavin on his journey . . . and hugs to his family. My thoughts and prayers are with you, Gavin and your family. God bless. Kate, I am sitting here half way across the nation in tears. Know that my prayers are with you, Gavin, Bryan and Ed. I am sure Gavin will enjoy being with Darcy and your dad in heaven. I am very sorry. I pray for strength and comfort for your family, you are amazing strong. Thank you for sharing your journey with us. My thoughts are with you and your family. Gavin will be ok soon, you and Ed and Brian will be ok. Just seeing your strength and perspective tells me you will be ok. It is painful, I cannot imagine your pain, but I try, to give you comfort. Hugging you all from afar and holding you and your family in my heart.. I have been following Gavin's journey as I was introduced to it by your sister, Meg and my daughter in law, Jordan. Many friends, in Texas where I live, have been praying for Gavin and your family. I am so heartbroken for you all and so deeply touched by your words of strength. I will continue to pray for you all as you journey together through this. I have been blessed by the amazing love and courage you have portrayed so beautifully on paper. Thank you for so bravely sharing your story. Rest assured, Gavin will find some way to let you know that he is happily playing with Darcy, Pop, and all of his brothers and sisters who have been waiting for him with open arms and will take good care of him. Praying for you and your family, for God to give you peace as I know He is now holding Gavin tightly for you. I am so very sorry. I am sobbing as I read this. May God give you the comfort you so desperately need in the coming days. My goodness, I am so so very sorry to read this. My family and I have been praying for Gavin and for all of you. People often misquote scripture and tell those who are in a time of trial and heartache that "God won't give us more than we can handle." That is not what God's word tells us. He tells us he won't tempt us beyond what we can handle, when we are tempted, He will always provide a way out. This is important to know because this may be more than you can handle. My 10 years of infertility and 7 miscarriages and two failed adoptions all felt like it was more than I could handle. It was more than I could handle - and this very likely is for you, too .... and it's okay. What's important to remember is that He is still with you. God will never leave you, nor forsake you. He is carrying you through this. Where this may feel like He's not there, remember that He is. He is carrying you through this storm, just like He did with Gavin's birth, Brian's diagnosis in-utero, Darcy's birth and passing, and all the medical emergencies. He's steadfast. He is with you. I'm so very sorry for your loss. For this world's loss. Gavin is very loved and now He will be resting is the sweet tender arms of Jesus. Many hugs and prayers as you and your family go through this extremely difficult time. This is a quote I just read today, "When God pushes you to the edge of difficulty, trust Him fully because two things can happen. He'll either catch you when you fall orHe will teach you how to fly." I am new to your blog, being guided here by Jessica at Four Plus and Angel. I am SO sorry that you have to return Gavin to the arms of God, but so amazed by your faith and courage. your post was beautiful and so eloquent, especially under the circumstances. Prayers for the hole in your hears to be filled by his memories. It is a long journey, but it will be filled with amazing things and people. God be with you and your family. Oh Kate! Oh Gavin! I am so saddened to read this. I know in my heart that God has a plan....just, in times like this, I wish is was more evident as to what that was. You are doing so much right. With Brian, thinking of us all to keep us updated. Us millions, we will keep praying. Just now it will be for a safe transition for Gavin. For some sort of peace and healing for you, Ed, Brian, and Sara. We will continue to chase rainbows with you if you let us. God Speed Gavin. God Bless all of you. With a heavy heart I sign off. My heart goes out to you and your family. I only began reading about Gavin on Thursday but from the moment I read the first post I was touched by you both deeply. The journey you have been on together has been a rollercoaster and I am so very sad to know that it has come to a much too early end. When I read about Gavin's cardiac arrest on Thursday I did Reiki for him and prayed for him. I haven't done either of these things in a very long time, but there was something about Gavin that made it feel very very right. My prayers will continue to go out to you and your family in this very difficult time ahead of you. I am so very sorry for your loss. I have been following your family's journey for some time and I am so very very sorry to see this. I will keep your family in my prayers. I hope that you continue to feel Gavin and his love around you at the times when you need it most. Much love to you all. I am in awe of the amount of grace, strentgh and courage you and your husband have. Gavin couldn't have picked better a better set of parents, he is such a lucky and loved boy. I will say a prayer for you and your family. Yesterday I saw a post from @FourPlusAnAngel and read the post you had written. I then went and read many others. I feel so blessed to have been introduced to such an amazing and courageous woman and her family. Thank you for sharing your story. Your pain, fear, joy, strength, passion and most importantly, your love. The strength you exude is inspiring as is the accomplishments that Gavin has fought for during his 5 years. So many things to celebrate that it doesn't seem possible to fit in such a short amount of time. Your family will be held close to my heart, sending peace and comfort to all of you. My heart aches for you and your family, but is filled with joy for Gavin as he makes the journey to meet his siblings. What a beautifully written entry, I am in awe of your strength and courage. God bless you. gavin has and will continue to have an impact on my and my family's life. you have also been an inspiration to me (and continue to be) as i navigate my daughter's disability. our prayers will be with you daily for strength and for peace. I am beside myself reading this, and yet I feel the peace Gavin has given to your family and know he will continue to do so from his Heaven House, with Darcy and eventually with my Quinn. I like to think of the bestest playground imaginable up there where all of these babies are freed from their unhealthy earthly bodies and are able to run and jump, shriek and laugh. They all play there together until we, their parents, can rejoin them at some indeterminate point in the future. Gavin will be added to the stories I tell Quinn about this magical place as another guide to help her when she's ready until we can be there again. There is nothing to tell parents who have lost a child, but if you ever need to tell anyone anything I am more than willing to listen. We're a small, exclusive, sucky club that no one else wants entrance to nor can they gain it without enduring the unthinkable. So heartbreaking. I used to read your blog a lot a couple of years ago or so (my daughter has CMD -merosin deficient).. now stumbled again here through Facebook. Prayers of peace for your family! Thoughts are with you guys. hugs. I'm so very sorry. You are so brave chronicle his journey like this. Wishing you worlds of love in a time of deep sorrow. I'm so sorry Kate, Ed and Brian. You faith and courage is beyond me. I'm happy for Gavin but sad for the world. God bless your family - in heaven and on earth. Sweet boy, rest well in Jesus' arms. So many thoughts and prayers. The love and peace that all of us have posted... the prayers from all over the country, from those like me, whom you have never met, all say what I would like to. Such sadness and grief at the same time as the beauty of being able to be with your beautiful buddha boy as his soul transitions... and as his soul and spirit soar. I also read Ed's comments... you both are so beautiful and honest. My love and prayers will be with you both, and Gavin and Brian and all of your loved ones, and those who love Gavin. I will also pray for those beauties that just might get the chance to live a whole, healthy life because of you, Ed and Gavin. Please know how much you all are loved. All I can offer is my prayers for peace and comfort and light. I know Gavin is about to be completely healed but not in the way we wanted. May the Lord bless him and you with a peaceful transition. I will continue to pray for your family. I pray for peace and comfort for you and your family, especially Brian, in the hopes that he will understand and be at peace with all of this. Much love to you all. Gavin, as you begin this new adventure, please take care of your mom, dad and especially your little brother. You have been an amazing teacher in your 5 1/2 years. Thank you for teaching all of us so much about life and about love. You will be greatly missed, Superhero. Kate, I can't even imagine the sorrow you are feeling. I never imagined I would read this post. Not even yesterday. I applaud you and Ed for choosing to donate Gavin's organs. My aunt and uncle made the same decision after their newborn died of a heart defect. If I remember correctly, 13 children were given a new life that they wouldn't have had otherwise. And his heart went to a research institute. 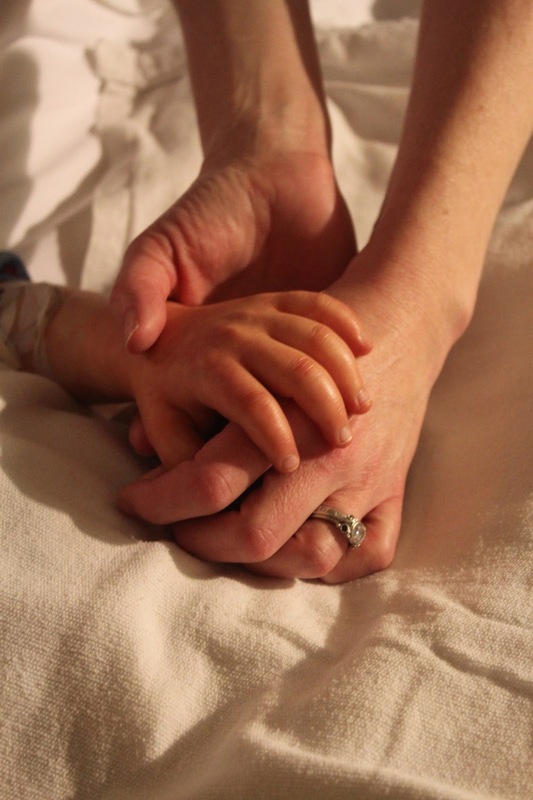 So while you are suffering an unimaginable pain, many families will be saved from that pain. But Gavin will soon be free of the body that has restrained him here on Earth. Perhaps this is the work of the mystery disorder that held him back. Or maybe God decided it is time for Gavin to be free of the troubles of this world. But no matter what, Gavin did what he was sent here to do. He has changed your lives and the lives of the many, many people who read this blog. Now that his work on Earth is done, he will go home. He will be free to do everything he wasn't able to do on Earth. He will run and talk and play freely. And just because he's gone doesn't mean that he is done changing the world. You will keep his story alive, and so will your readers. He is passing the reins over to you. Over the last 5 1/2 years, he has given you everything you need and now it's YOUR turn to change the world. And I know you will, Kate. You are a fighter. 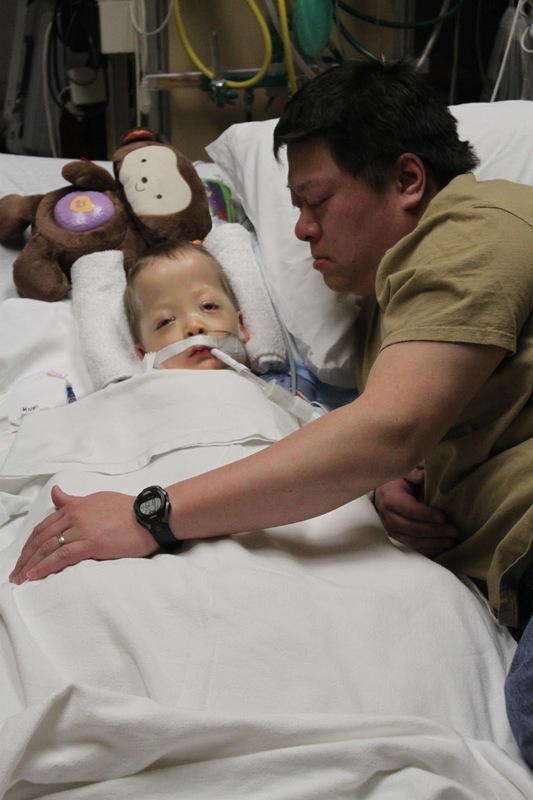 You have fought for your little boy and now you will help families with kids like him. Even if it's just because you are able to comfort them with your story so that they know they're not alone. And please know the YOU aren't alone. We are all hear to listen to what to have to say. We love you and your family. I do hope you will continue writing. I just can't imagine the pain you are going through right now. My daughter's urn sits on our mantle and I can't imagine ever having to place another one of my children's ashes beside it. I am sending you and your family so much strength in the days to come. Prayers continuing for your family, and for Gavin as he starts his new journey. It's so terribly sad when a parent loses a child, there are no words I can say to express the sorrow I feel for you. Your strength through the ups and downs has been an inspiration. I know he will be greatly missed here, but Gavin will have many companions on the other side and he will be so happy. May the Lord be with you and bring you peace and comfort. Please know that one Mommy in CA is praying for you and your beautiful little family. May you have strength, peace, and courage during this unbearable time. God will watch over you! Kate, Even though I have been out of touch, please know that all of my thoughts and prayers and with you guys. I keep picturing Gavin's sweet smile and hoping for some peace for all of you. Gavin and your family have truly touched my heart. It breaks for you and those left on earth right now but rejoices for Gavin's journey to "Heaven's House". I will pray for peace and healing as you and your family prepare for your goodbye's. I know it is never easy but there must be some comfort in knowing and believing in your faith. Thank you again for sharing your journey through the ups and downs. After following you for only a week I have become someone who prays OUT LOUD instead of silently. I am praying LOUDLY for your entire family and stand in awe of your strength as a Mommy. You and Gavin exchanged so many gifts with each other and he will live on through the many people he has touched. I am a twin myself, and in the midst of all of the heart ache I am feeling for your family there is a sense of calm knowing that he will be with Darcy. The one constant in my vision of heaven is that once we are there we can take on whatever form we want to -- I know that Darcy will bring him the warmth and comfort of his Mommy -- the warmth and comfort she got directly from you. Praying for you and sending love. Imagining the fun he'll have and the legacy he'll leave. Love to you all. death. Reminds us to not take any moments for granted. How your family's story has touched me. I wish you all peace and strength. I'm so sad to read this and so incredibly sorry for your loss :( You don't know me, but I was briefly a member of the PS group and I have a son Gavin's age. I keep in touch with a few of the ladies in the group and was so sad when I read your latest updates on your blog. Sending lots of love and hugs your way. Our thoughts and prayers are with you and yours. Peace be with you. I am so sorry. So, so sorry. This is news no parent ever wants to receive but you have received it with so much grace, dignity and faith. My prayers to you and your babies. So sorry for your loss. I am blessed by your courage and inspired by this story. What a blessing to have shared the tender times you had with Gavin. What a gift and treasure he was and will always remain. I pray you will feel the presence of the Lord suring this time. I pray you will be enveloped by love, comfort and peace. God bless you all! I am speechless!! I have been reading you blog for years, but don't think I have ever commented. I am so sorry for your loss... I will be praying for your family! I cant say anything profound.nothing poetic or even therapeutic. Know, though, that we strangers here are praying for your continued strength and are celebrating Gavin's Heaven home. Amongst the angels he will play, healthy and strong, even as he watches over his earthly family. Blessings to you. Continue to chase rainbows. Psalm 43:3 - Send me your light and your faithful care, let them lead me; let them bring me to your holy mountain, to the place where you dwell. ~ Even though Gavin is in the most amazing place, in the most amazing arms, I know that your hearts break. My prayers will be with you and your family. God's love and time will never completely heal a loss like this, but it will help. I pray you find comfort and peace. I'm holding space for you, Kate, and sending you love across the miles - I don't know you but I KNOW you. Your Gavin sounds like a beautiful soul. Thank you for sharing Gavin's and your family's story - this is something no parent should have to go through ever - I've only recently discovered your blog and your honesty and courage is so uplifting. And Gavin will without a doubt live on in many many many ways. I'm so so sorry. I only just heard of your blog a couple of days ago and have been humbled by your journey to Motherhood. I'm astounded by your strength, your grace, and your eloquence as you face such heartbreak. Many, many blessings upon you all and gentle hugs to your sweet boys. Your family's story moves me in every way possible. I do not know you personally but feel like I do through your stories. Thank you for being so open and honest throughout this horribly unfair time of your life. I wish I knew Gavin, clearly he has touched so many lives. May he be happy forever in his new reality. Much love. I am so sorry for your loss and even though this is the first I am visiting here I join you in your tears, I am in awe of your strength. You were blessed with a sweet angel. May he Rest In Peace. Another one who is lost for words but I am sending you all of my love and hugs across the ocean. I will be keeping you all in my thoughts and prayers. I hope the coming days are as peaceful as they can be for all of you. My heart is with you all. Love, light, and peace. Keeping Gavin & your family in my prayers for strength, grace & comfort. Praying for peace for you all. And sending so much love, anonymously yet with power and truth, from one mommy to another. I am so incredibly sorry. My thoughts and prayers are with you. My heart is breaking for you, dear Kate. Praying for you and your family. Oh my heart is aching for you and at the same time I do feel the joy you speak of. To know that he is free and healed - how incredible. I found your story when I first started my daughter's Caringbridge page 2 plus years ago and I was inspired by your family and your candid thoughts. Thank you for sharing Gavin with us. My prayers and heart will be full of you tonight. I am so incredibly sorry to read about little Gavin. Holding you all close to my heart in this difficult time. With tears in my eyes, I am fervently praying for peace for your family. Organ donation is truly noble. One of my best friend's son is on the heart transplant list; he is only ten. It will be by the generous and selfless act of folks like you that will save his life. You are so right. Your son will now be a hero - helping and healing perfect strangers. Bless his heart. Bless your family. Kate, our hearts are breaking for you, Ed and Brian. Your journey with Gavin has touched us all, he is an incredible boy with incredible parents. Love and prayers, you are constantly in our thoughts. I am so very sorry. What a special boy who had the best family. Sending prayers and hugs. Okay....as you requested, I am trying to focus on being happy for Gavin. I like to think he's having a running race with his Pop. Pop of course lets him win which throws him into a fit of giggles. I am so sorry that Gavin doesn't get to stay in our world and continue to amaze us every single day. He will live on in the hearts and minds of millions of faithful superhero followers. I hope and pray that the transition for your family is a peaceful one. Please take care of your self. Your family remains in the prayers of millions of people around the world. My heart aches for your loss. I never had the privilege of meeting your sweet baby, Gavin, but since I saw your post the other day, I felt like he took up residence in my heart. I prayed and prayed for God to bring your family safely through, to bring you comfort and peace, but underneath that, I hoped that God's idea of peace and comfort was the same as mine (though it would seem that is rarely the case). I will keep praying for all of you. Your strength and courage is an inspiration! Gavin is not the only amazing and inspirational one - you are. The fact that you somehow found the strength to write this in the midst of what you are going through absolutely blows my mind. In the coming moments, days and years, when it all feels too tough, please take a deep breath and know that, somehow, you can find the strength to take the next breath and step forward. There are a lot of hearts grieving with yours. As you suggested, Gavin will be set free and experience happiness and joy in heaven - may that give you and your family a small amount of comfort. If you haven't already, find the books about the water bugs/lilies and the rainbow path to read to Brian. You will all continue to be in my prayers - God bless. Having lost a child myself, I know there are no words to help. Just know that my heart is breaking for you, and my prayers will not stop. He will be happy in Heaven and will be another of your own personal angels. Your words make me feel less alone in the world. Your children are so beautiful, including little Darcy. I lost my daughter around the same time... your video of her made me sob. Thank you for sharing this horrific journey that is also a wonderful one as well. Gavin will be remembered. I am so very sad with you. What a precious boy to do so much in such a short space of time. Wishing you peace during this time of unspeakable sorrow. Your strength is amazing. Kate, I have followed your blog for about a year. What a shock I got when I read your latest post. My heart goes out to you, Ed and Brian. I pray that the knowledge Gavin is free of the pain and physical limitations will give you comfort over the difficult days ahead. Strengthen and sustain in their hour of grief Kate, Ed, Brian, and all who knew and loved Gavin. Thank you for the gift of dear Gavin and the joy he gave all who knew him, all the precious memories of him that will abide with them, and the assurance that Gavin now lives forever in the joy and peace of your presence. I said a prayer for your family, and I wish you much peace during such a hard time. What a blessed boy to have such a loving family, and what a blessed family to have such a sweet boy. I'm so so sad to read this. In his short life Gavin was a hero and now in his passing as well. My daughter is a transplant recipient - be assured that Gavin's gift of life will be treasured and he will continue to change lives long after he has left this world. Prayers for your family. Gavin was so lucky to have such amazing devoted parents who did everything they could for him. And now in your difficult time, you are doing everything for other families with sick children. There is a special place for you in heaven, and Gavin will be waiting for you there with his brother and sister. Though we'll never meet, our lives are somehow intertwined as mothers. Sending you love from across time and space as you grieve the loss of your loving little boy. Kate, I am at a loss for words. My heart aches for you and your precious family. I held myself together together at work today and the tears poured out as I drove home in the car. Praying for you all. God Bless. Sending you so much love... Prayers. My heart is breaking for you. Prayers coming your way. What admirable faith you have and how blessed your little boy will be in Heaven with the Lord. Sending you love and peace from a mom who has walked a parallel journey. I hope you cling to one another tightly and yet gently. Sending my deepest condolences and much much love to you, Ed and Brian. I know Gavin is running around, laughing and playing right now, after having fulfilled his very important mission of being a light and inspiration to so many. Many blessings to each of you. We're praying for you, even as we are celebrating for Gavin. Bless you for your courage and for sharing what has to be an agonizing story with so many of us.